Welcome, readers, to my second profile featuring an organization that provides shelter to cats, with a large percentage of their residents being special needs. 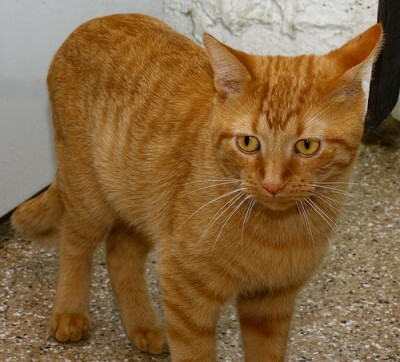 Today, we have with us Garfield, one of the residents of Cat Guardians, a no-kill, cageless shelter in Lombard, IL, a suburb of Chicago, that specializes in street rescues. It has been open since 1988. Tell me how you became affiliated with Cat Guardians. Well, Crepes, it’s a difficult story to tell, really. I was left in the Cat Guardians’ parking lot tied to a tree. The person that did that gave me a litter box, but no food or water. So you had a place to use the bathroom, but nothing, shall we say, to deposit. That’s correct. A word of advice for humans out there: a cat would much rather have food and water than a litter box. I concur, Garfield. I know if I need to go, I can go anywhere, but if there’s no food or water, well, I’d be kind of out of luck. Now, tell me, in your own words, what is the mission of Cat Guardians? Cat Guardians rescues abandoned and stray street cats. They provide the medical and socializing care that we need and find us forever homes. Since they’re a no-kill shelter, each one of us is guaranteed a permanent place to live until we’re adopted. I’ll bet that was a load off your chest when you found that out. What is the Cat Guardians facility like? Charming, really. It’s a small, white house in Lombard, IL. The “basement” is the main shelter area. There are quiet rooms for kitties that need a calmer atmosphere and a special room for the FIV kitties. FIV meaning Feline Immunodeficiency Virus, like a kitty having AIDS. And how many cats can the facility keep at once? They’re allowed to keep 50, which is the maximum allowed by Lombard law. And what percentage of the kitties there have special needs? Well, because Cat Guardians only does street rescues, the percentage of special needs cats is constantly changing. On average, approximately 25% of us cats and kittens are special needs. That’s a rather large percentage. Does the staff care for you well? Actually, we don’t have staff. We are run completely by dedicated volunteers. No staff! That’s truly amazing. I can only imagine that your volunteers really are extremely dedicated. It takes amazing organization and leadership in order to be able to run such a place entirely by volunteers. So how is Cat Guardians funded? Completely through donations of our supporters. Which, as I see it, means that since it’s run entirely by volunteers, all donations go directly to running the shelter. That’s really fantastic. Now, if some kind-hearted reader wanted to help the Cat Guardians but was unable to adopt, what could they do to help you out the most, even if they don’t live in Illinois? Such an individual could make a donation via our website, or even sponsor a cat! They can also “Shop to Help.” We have partnerships with various vendors that allow a percentage of the profits to directly benefit Cat Guardians. I saw some cozy little “Kitty Clams” on there that I’ve got my eye on. Tell me a bit about your sponsorship program. The sponsorship program benefits the cats that are unlikely to be adopted due to their age or because of medical or behavioral difficulties. Cat Guardians needs funding to provide for these kitties, and you can help by sponsoring any one of them. 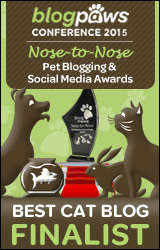 Is there a minimum amount necessary to sponsor a cat? A $20 sponsorship will give you a biography and picture of the cat, a certificate of sponsorship, and a little gift of appreciation. Twenty dollars? That’s less than one dinner out these days and will support a kitty for a whole month. I’m sure there are some fabulous people out there that can make that happen. So it’s like having a cat without the risk to your leather couches. What a great idea. Garfield, is there anything else you’d like to share with us about Cat Guardians? Actually. I have a little statement here that Cat Guardians gave me that I’d like to read. Well, yes, I suppose I can. It’s just surprising but nice to see so many literate kitties out there these days. Please continue. 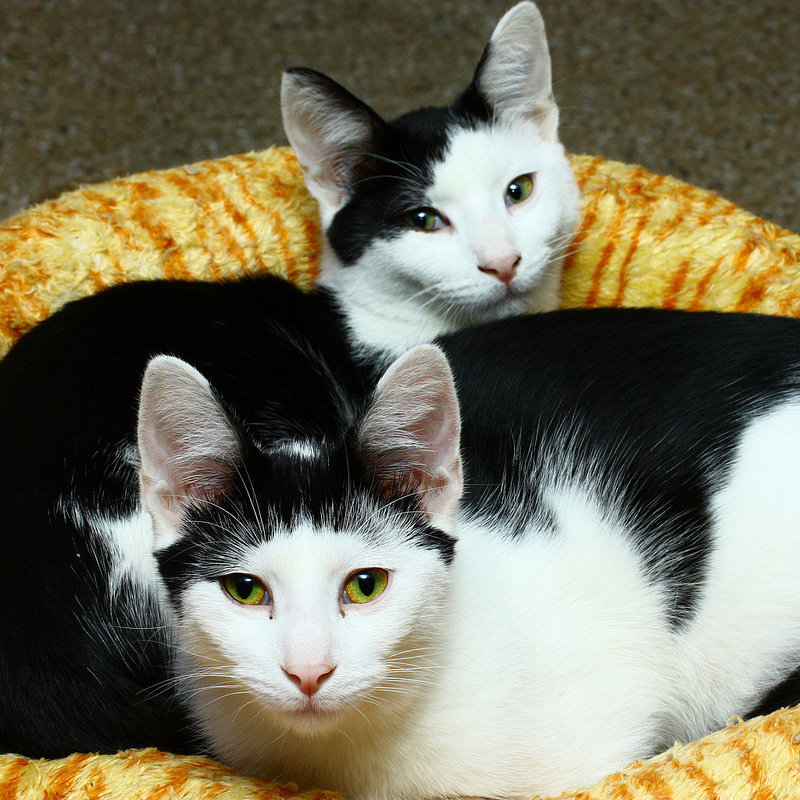 :: eh hem::: Cat Guardians says: We are the advocates for the cats and kittens in our care. We are their voice and their protection, and they are our family. We strongly believe in spaying/neutering and support TNR efforts in our area. Our volunteers come to us to help the cats, often finding that the cats help them, either by helping cope with a loss, by providing a sense of accomplishment, or by providing a way to make a difference. Perhaps, most of all, the cats and kittens we rescue remind us of how lucky we are not to have suffered as they have. We have a sense of awe at what these cats and kittens have overcome just to survive. That’s really touching, so very true. 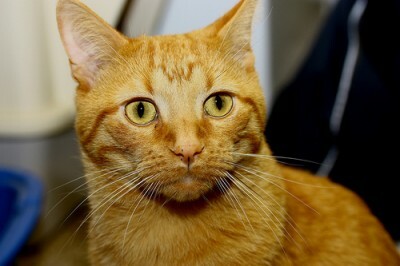 Garfield, are you currently looking for your forever home? I am, yes. Initially, after my rescue, I didn’t trust people very much. However, after knowing the volunteers at Cat Guardians for a few months, I learned to be affectionate, but I still get a little nervous if there’s too much going on. I don’t get on too well with small children, either. I much prefer adult conversation. Well, Garfield. You have been a tremendous help. Thank you so much for being here and for sharing your knowledge of Cat Guardians with us. There it is! My profile of Cat Guardians. We’ve learned that they are doing some amazing things, particularly since they are run entirely through the kindness of volunteers, something you don’t see terribly often. Since they’re only allowed to have 50 cats at a time, the more kitties that get adopted from them, the more they can find room to help others. So, if you’re considering a kitty and you live in the Chicago suburbs, don’t forget to visit Cat Guardians! A special thank you to Amita and Dawn for helping me get together with Garfield. If you’re interested in learning more about other shelters, see last week’s interview that I did with Tabby’s Place. ← Poetry Challenge: A Naughty Limerick! I loved hearing about Garfield’s(good name-I have a Garfield in my picture)story and his shelter.Thank you for telling his story. Hope all the kitties can find a forever home. way awesum inter views crepes; N garfield…may st francis guide ewe ta yur new forever home reeeely reeeely quik….sorree ya had ta go thru ….what ya wented thru….we R gonna hafta chek out de…clams…. Kudos for the staff who worked to restore Garfield’s trust after his traumatic past. He’s going to make a wonderful cat companion. Thanks also for the mention of the joy of fostering.